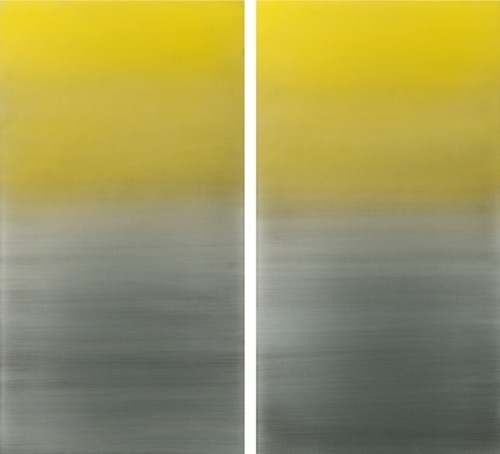 Miya Ando, Gold Diptych, 2015, urethane and pigment on aluminum, 48 x 48". The word ephemeral appears often in the titles of Miya Ando’s recent paintings. There is Ephemeral Blue Grey Winter, 2015, Ephemeral Vermillion, 2015, and Ephemeral Blue Triptych 2015, among others. The description contrasts with the durable quality of Ando’s metal canvases, hinting at her focus on nature’s impermanence, the passage of days and seasons, in the context of a seemingly solid industrialized world. By brushing layers of urethane and pigment onto sheets of aluminum, Ando created ninety new abstract works for an exhibition at both of Sundaram Tagore Gallery’s locations, in Hong Kong and Singapore. Her landscapes are serene and contemplative. They evoke dawn and evening, floating clouds and fog, rising tides and frozen lakes. They showcase the artist’s uncommon skill, which is steeped in the tradition of her ancestors. Ando is a descendant of Bizen swordsmiths and spent part of her childhood among Buddhist priests at a temple in Okayama in southern Japan. She apprenticed at Hattori Studio, with a Japanese master metalsmith, and has founded her practice on the transformation of metal surfaces using heat, sandpaper, grinders, pigments, dyes, and other chemical substances to produce variations of texture and color. An installation piece, Formal Kimono, 2014, stands out among the Minimalist paintings. With its dark hues and appearance that recalls chain-mail armor, the work connotes war in a manner that speaks vividly to Ando’s sword-making heritage. The kimono is made of steel and hand-dyed aluminum that have been subjected to blackening and anodization, respectively—two modern industrial processes that build the metals’ resistance to corrosion and wear, a resistance to the forces of impermanence.